They did it. They finally did it. 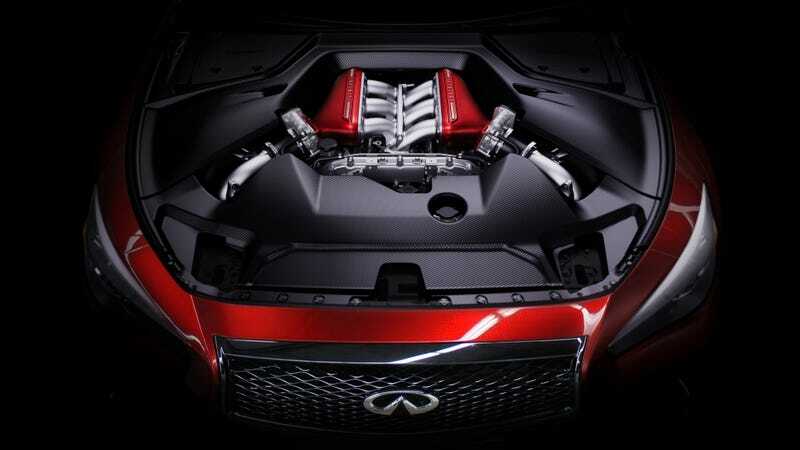 Today in Geneva the hood was lifted on the Infiniti Q50 Eau Rouge, and it has the engine we've always wanted: the 3.8-liter twin-turbo V6 from the Nissan GT-R with 560 horsepower and 443 pound-feet of torque. The last time I hung out with Infiniti CEO Johan De Nysschen, he swore up and down that slotting a GT-R engine into one of their sedans was probably not a thing that was going to happen. Turns out ol' Johan pulled a fast one on us. A very, very fast one that the Germans and everyone else should be afraid of. Infiniti doesn't come out and say that it's THE GT-R engine, but with all-wheel drive and displacement and power figures identical to their supercar destroyer, well, I think we all know what's going on here. It even sounds like the engine we know and love. They say the car will do zero to 60 mph in under four seconds, can do up to 180 mph, and has a seven-speed automatic gearbox, but not the dual-clutch the GT-R gets. Oh, and all-wheel drive. It has all-wheel drive with a 50/50 front-rear torque split. No word yet on production plans, but Infiniti says this concept is a "potential powertrain" for the Q50 Eau Rouge they want to build. Build this one, Infiniti.